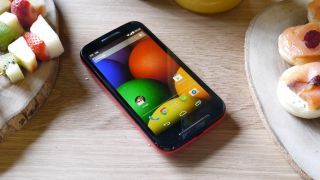 It's not a stretch to imagine that Motorola would release a follow-up to its affordable Moto E handset, after all the Moto G and Moto X have both been refreshed. But now we can do more than just imagine as the first hints of a new Moto E / Moto E2 or whatever it ends up being called, have now emerged. Greek site Techmaniacs.gr claims to have been hands on with the phone and is reporting that the main change is that it has a larger 4.5-inch display but with the same 540 x 960 resolution. That sounds similar to the upgrade made with the second generation Moto G, which also received a boost in screen size but not resolution. Internally the new Moto E will apparently be very similar to the original Moto G. The site claims that it will "probably" have a Snapdragon 400 processor and 1GB of RAM, but is unable to confirm either of those details. It will also supposedly have a 5MP camera with no flash, just like the current Moto E, however the new model will apparently support 4G, which the current one doesn't. The design is said to be similar to the current model too, with a thick build but a good amount of grip. Finally the site claims that it will run Android 5.0, is very responsive, will be very cheap and is likely to be announced soon. That all sounds fairly believable, and roughly matches up with a Geekbench listing from last month, which showed an unannounced Motorola handset as having a quad-core Snapdragon 410 processor and 1GB of RAM. Unfortunately though the site wasn't able to snap any images of the phone to back up its claims, so as always we'd take them with a healthy helping of salt. The EE Kestrel is a low cost alternative.